G.H.O.S.T. 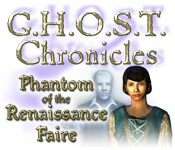 Chronicles: Phantom of the Renaissance Faire finds you hot on the trail of a menacing and terrifying ghost. This vengeful ghost has damaged attractions, vandalized shops and has driven away the park patrons. Inspect the park and determine if this is indeed ghostly activity or just a cruel and disastrous hoax. It is up to you to find out who is behind the haunting at the Renaissance Faire in this exciting Hidden Object Adventure game. Dive into and explore an underwater country, and help Dorothy find out the truth about her family and save her daughter!